Very nice progress towards v4.0. Keep on the good work! 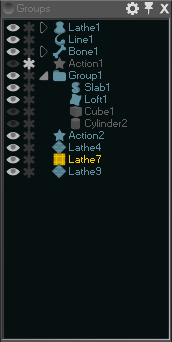 I'm going to experiment with little icons in the groups window to let you know if the item is Mesh/Prim/Curvy/Group. Trying out new groups icons. The square and diamond ones are for DynaMesh and QuadMesh, the rest share their creation tool icons. Also shows the new "Group" that behaves much like a Folder on a computer. I find myself using a few commands and tools a lot, and very rarely needing a more specific tool. I also find I use tools in clusters depending on the stage I am at in my workflow. The normal solution to this may be to have hotkeys for the very frequent things (Increment & Save, Transform Tools), Toolbars for the usual/recent tools and commands, and Rooms/Workspace Layouts for each stage in the workflow (Curves/Sculpt/Materials+Texturing). I also want to push towards a simpler interface where possible, perhaps a "Basic Mode" that hides the clutter. But at the same time I want to make the features easy to discover - so you can browse brushes and commands and find useful features and learn exactly how to use them. Ideally most of that would fall out from having a customisable workspace, but I am interested to see how a dynamic toolbar might work - tracking recent and frequently used tools. I guess this is like keeping a tool out on the desk for a bit in case you want to reuse it before it gets put away again. After working with the Alpha UI for a few months - adding more features and stress testing the new panel system - I realise I need to spend some time working back towards the "simple & easy" goal while keeping all the extra functionality. To this end I'm going to revamp the panels with tabbed panels. You'll still be able to move and organise the panels as you wish, but rather than try and stack lots of different functionality in each sidebar - most of the time you'll only have 2 or 3 panels visible, with the rest either hidden, or tidied away on a tab above the currently visible panel. This should let me actually add more breathing room and neater design to the panels as they won't have to squeeze as small as possible to fit loads on screen. Also - I'm going to move "one-shot" effects (Like a Filter in PS) to floating/undocked panels, so it is clear that they are in control of the app while they are visible, and will complete/cancel if you click away. Hopefully this UI work will cumulate in a new Beta at some point! Tabbed, dockable panels are working now. It is refreshing to gain back so much screenspace with things tidy and still easily accessed as Tabs. I'm also going to go down the standard route of having temporary dialogs simply float over the views while they are being used (no need to dock everything in the sidebars) and using a simple preferences switch to show/hide the menu and status bar - so they don't need to get bogged down in handles and dialog controls. I'm also working on some new (optional) toolbars for frequently used commands, and I'm expanding the in-view buttons with useful stuff - but these will mostly be hidden along the corners of the view and should only appear when you move the mouse to the corner (It was feeling too cluttered with all the icons there, but the utility is so high I agree they should be available). You can still 'undock' a dropdown menu from the main menu, great for quickly repeating commands or doing a sequence of commands from a menu... but I'm not letting these panels dock at the sides any more - it is not helpful.